Before you say, “Iron Giant has been done so many times already,” WAIT! This beloved property has stood the test of time and fans still can’t get enough of this Brad Bird masterpiece. A remastered version of the 1999 classic is currently back in the theaters and includes two deleted scenes. Dark Hall Mansion is paying homage to this family favorite with a VERY special offering. They have partnered with Warner Bros. Entertainment, Brad Bird and Disney artist Jeff Granito to bring you some truly exceptional prints. Here is what DHM has in store for you. 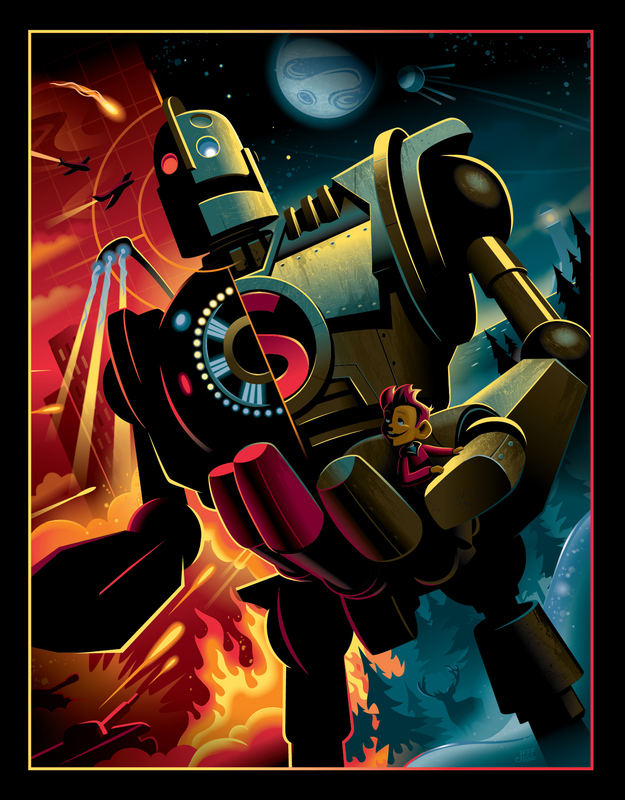 Dark Hall Mansion, is pleased to release the officially licensed Brad Bird “Iron Giant: Signature Edition” print and metal series along with DHM’s Jeff Granito “Iron Giant” limited editions, all on sale this Friday, October 2, 2015. 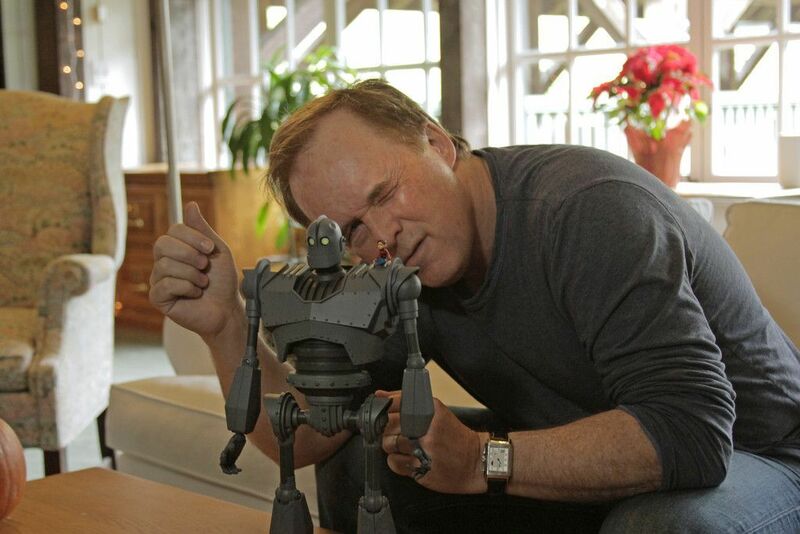 Dark Hall Mansion, under license from Warner Bros Entertainment, will release these special Brad Bird editions in conjunction with “Iron Giant’s” limited in-theater screenings with Fathom Events around the country as well as Warner Bros high definition re-release of the “Iron Giant: Signature Edition” movie. The artwork for these select editions was developed by the Warner Bros artist team and director Brad Bird (“Tomorrowland,” “The Incredibles,” “Ratatouille”) was instantly taken, personally requesting it be released as a fine art edition. *NOTE: The Brad Bird “Iron Giant: Signature Edition” Metal editions will be available as a timed release, buyers may place their order but only until 11:59 PM PST Friday, Oct 9th, at which time the order window will close. Final orders placed will determine the size of this edition. Dark Hall Mansion is honored to have gotten the call from Warner Bros and proud to release two select editions, the Brad Bird Standard 18″ x 24″ edition, hand numbered and beautifully printed on rich paper, and an 18″ x 24″ hand numbered edition printed on metal that monitor image do not do justice! The nature of the artwork Brad Bird was so drawn to is fully complimented by the edition’s printing on metal, not only as to the thematic connections to the subject matter, but the beautiful high gloss finish and sheen of the finished pieces which are truly something to see in person. 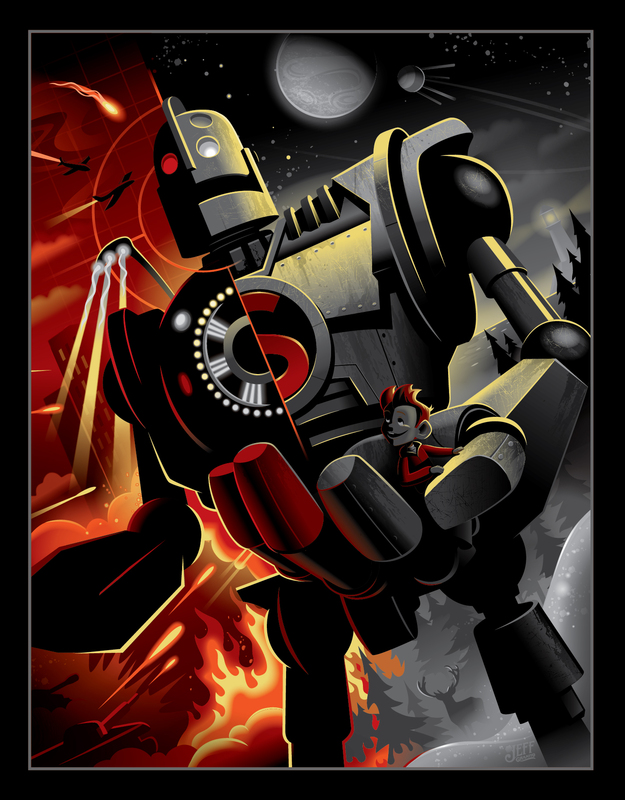 DHM is also most pleased to reveal our officially licensed “Iron Giant” limited edition print release by contemporary artist, Jeff Granito. A striking piece that addresses the “Iron Giant’s” duality, one powerfully voiced in Hogarth’s informing his otherworldly friend, “You are who you choose to be,” the piece also addresses humankind’s relationship not only to the “Iron Giant” but to those choices we make for ourself and our world. Artist Jeff Granito beautifully and evocatively encapsulates high science, the pastoral, and those very choices within each of his editions while never forgetting the charm and love that informs the “Iron Giant’s” relationship with Hogarth. 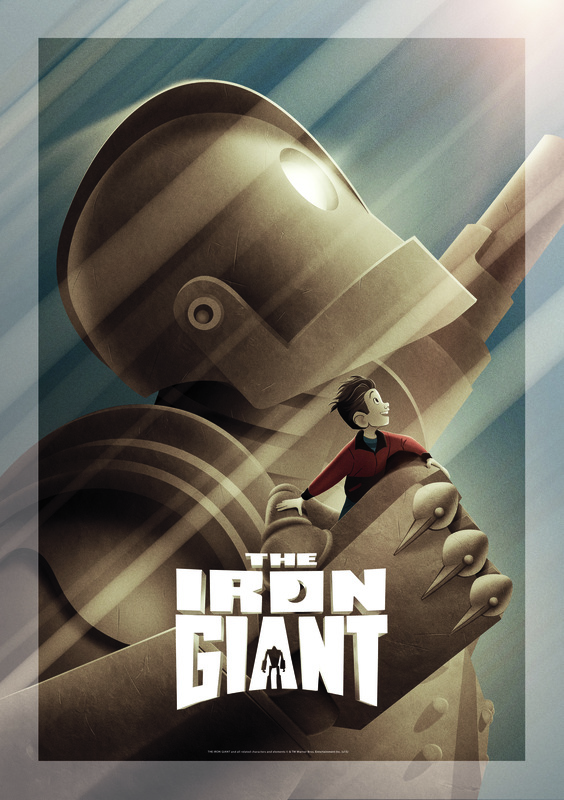 All officially licensed Brad Bird “Iron Giant: Signature Edition” prints and metal editions, as well as Jeff Granito’s “Iron Giant” limited editions go on sale this Friday, Oct 2 at 9:30 AM PST on DHM’s OFFICIAL STORE PAGE. 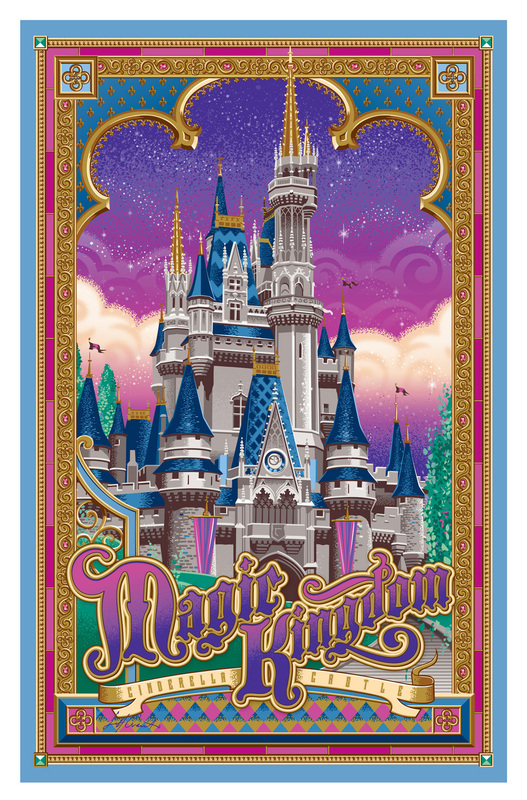 Jeff is coming off a recent collaboration with DHM for The Twilight Zone and has done some spectacular work with Disney. We spoke with him recently and here is what he had to say. BLURPPY – Tell us about yourself? How did you get involved in pop culture art? JEFF – I’ve been creating art for product and style guides for nearly 20 years for companies including DC Comics, Cartoon Network, Fox, Sesame Street, Warner Bros. and Disney. From there I have been asked to go beyond graphics and create fine art with the characters and properties that I have grown to know very well. 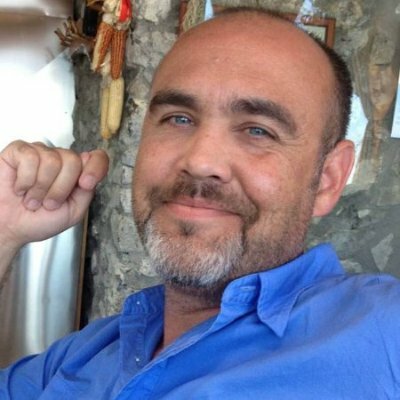 BLURPPY – You have worked with Disney for awhile now, tell us about your work with them. JEFF – While I have worked with other divisions throughout the years, my closet affiliations are with the Parks. I have created graphics for product, signage, identity and everything in between. In addition to recent work for Wonderground Gallery and Vista Galleries aboard the Disney Cruise Ships, one of my favorite recent projects was creating a collection of 8 pieces to commemorate the 6 decades of Disneyland for the 60th anniversary released every 2 months throughout the celebration. BLURPPY – How did you approach the Iron Giant Project? What’s your process? JEFF – First I rewatched the film several times to refamiliarize myself with the film. I want to look at it as if it was the first time, rather than rely on my personal impressions of the characters and story. Next, I tried to determine the heart of the story. With the Iron Giant, I wanted to portray the duality of the title character-and that he is, at the core, a gentle soul, who can become the dangerous monster that he is perceived to be when pushed far enough. BLURPPY – What do you have coming up that fans can look forward to? JEFF – In addition to the pleasure of having the opportunity of working with Dark Hall Mansion on this piece and the recently released Twilight Zone poster, I am creating some new work with them that I am very excited about. I am also looking forward to releasing some new Wonderground Gallery Artwork here in California and a visit to their sister gallery in Walt Disney World in the near future. 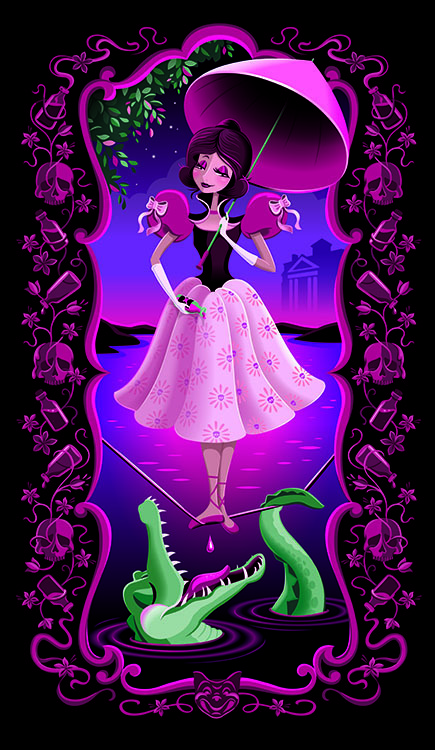 I have 2 new Haunted Mansion pieces and a Belle piece coming out. I am also looking forward to spending time at the historic Hotel del Coronado. They have chosen to use my art as the inspiration for their holiday theming this year and have created a line of art and product to commemorate the season. 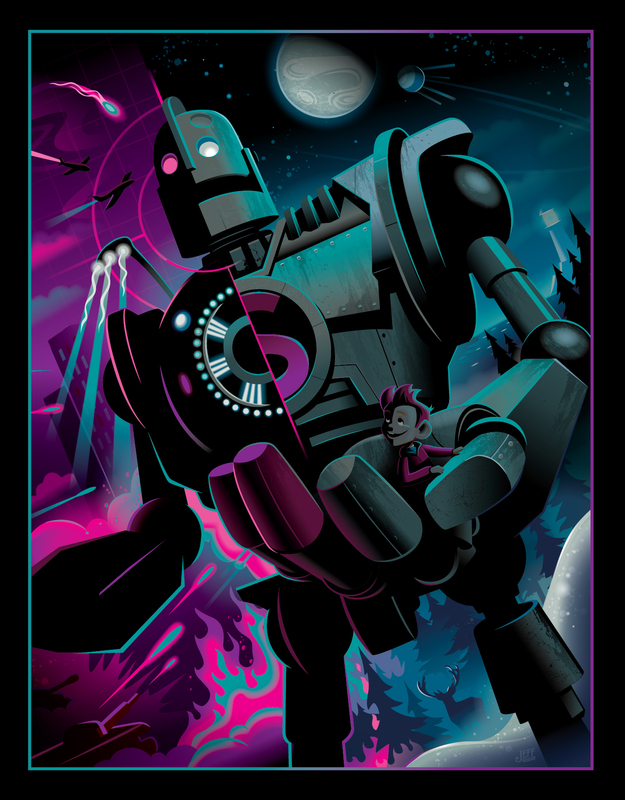 This entry was posted in Art, Comic Books, DC, DISNEY, Movies, Posters, Science Fiction and tagged Brad Bird, Dark Hall Mansion, Iron Giant, Jeff Granito, Limited edition, metal prints, officially licensed, posters. Bookmark the permalink.